Mohammed Al Marri and Nadir bin Hendi produced the perfect performance to win a dramatic and incident filled Russian Grand Prix, held on Moscow's Khimki Reservoir and in appalling conditions, maintaining the team's perfect start to the season and defence of their World and European titles, making it three wins out of three for Victory 1. After a red flag and an aborted first start, Victory 1's scratch-pairing and Championship leaders' showed their superiority and dominated the race to lead from start-to-finish and win by over a minute, to give Mohammed Al Marri - replacing the injured Arif Al Zafeen - his 11th career win and Nadir bin Hendi his third win in a row. "We made a good start and were clear by the first turn and from that point we were able to control the race," said Bin Hendi. "Mohammed did a great job today on a very tight and difficult course, a real driver's course." For Qatar 96's Sheikh Hassan and Steve Curtis, second place was a result they desperately needed after the disappointment in Montenegro, but not the one they wanted, which now leaves them 29 points adrift of the leaders' in fourth place. However, the outcome may well have been different if not for the coming together with Victory 7 after the restart, which left them trailing in fifth place at the end of the first lap. "We hit them going into a corner and got knocked into the course, so we had to go round and take the corner again. And by the time we were back in the race, it was a case of playing catch up," said Curtis. "It was no ones fault. It was really tight out there. They went wide and we were pushing hard and went for the inside line. I don't blame anyone, but I am not sure how they see it." Qatar 95 made it a double podium-celebration for the team, with Abdullah Al-Sulaiti and Matteo Nicolini taking their second consecutive third place to stay ahead of the their team-mates in the title race. 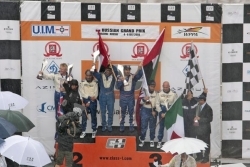 "We are happy with the result but it was a difficult race," said Al-Sulaiti. "We had a problem with the power steering from the beginning so you can imagine over 23 laps how difficult it was. But we managed and finally after a difficult weekend we got something out of it." For Victory 7's Abdullah Al Mehairbi and Jean-Marc Sanchez, finishing in fourth place, there was frustration and anger, after a broken a propeller on lap seven robbed them and the team of a probable second consecutive one-two finish. "I didn't see anything. We took the turn and we were hit," said a clearly irate Sanchez, about the incident with Qatar 96. "They wanted to go where there was no room. We were in front of them. If it was somebody's fault it was theirs. What's more frustrating is that we missed out on second place after having to stop and change the propeller." Giampaolo Montavoci and Kolbjorn Selmer maintained their reliable form to secure more points by taking their third consecutive fifth place finish. This keeps them in fifth place overall in the Championship after finishing ahead of Jotun's unlucky Jorn Tandberg and Inge Brigt Aarbakke, who, after starting from second place on the front row, broke a propeller on lap five when running strongly in third place, which ended any hopes of a podium finish.